Aspiring City lawyers can now get a flavour of life as a trainee through a pair of virtual reality goggles. 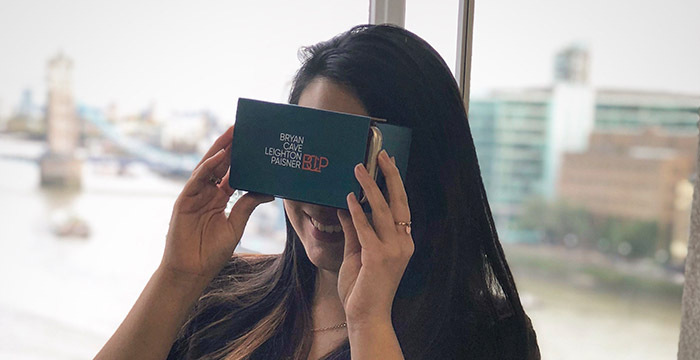 As part of its law fair offerings this year, international outfit Bryan Cave Leighton Paisner (BCLP) has created a series of interactive 360 degree videos that give prospective trainees a unique insight into City law life. Having popped on the headset (which is actually made of cardboard and uses a mobile phone as the screen), students can move their heads to look around the various parts of BCLP’s London office and meet some of its lawyers and trainees along the way. The virtual reality tour isn’t just confined to the office. Students can hear one trainee waxing lyrical about the deals he has worked on while he stares wistfully at The Bank of England; another rookie stresses the importance of teamwork as she gazes up at at the spires of the Royal Courts of Justice. Other videos in the new series give wannabe lawyers a feel for life on secondment and how the firm is implementing legal tech. As part of the video series, the firm is also running a competition for prospective trainees. Students will have to submit answers — based on clues hidden in the videos — for a chance to win, among other things, an “international trip” courtesy of the firm. Legal Cheek readers who don’t have a set of goggles to hand can experience the tour by viewing the YouTube video embedded below. Top tip: use your computer cursor (or finger if using a mobile device) to look around. This, however, isn’t the first time a law firm has utilised virtual reality tech. In 2015, CMS Cameron McKenna (now just CMS) offered prospective trainees an opportunity to experience a helicopter flight at 1,500 feet or, alternatively, race around a track in Ferrari — all in attempt to make commercial awareness more interesting. The post Bryan Cave Leighton Paisner gives law students a taste of trainee life with virtual reality goggles appeared first on Legal Cheek.